Mrs. Dibe (80) is her energetic self when I arrive at her home in Batho Location, just before noon. Adelina and her daughters Bella and Salomé collect plastic litter in the location, every day, and stock it in their yard in huge bags provided by the recycling company. Collecting and sorting is hard work for little money under an unforgiving sun, and the competition is fierce. But today, Adelina Seboilwe Dibe isn’t wearing her work clothes: she has changed into a beautiful white dress with a flower print for our little portrait session. She has an old framed portrait of her parents, and we get started. Zacharia Majawetsa and Anne Chopie, ca. 1930. Then, she surprises me with a similar portrait of her late husband, Cecil Shuping Dibe. It is amazing to see the old man (as Adeline lovingly refers to him) as a man in his prime, for the first time. Printer by trade and human rights activist under the Apartheid regime by conviction, Mr. Dibe was one of the stalwarts of the Struggle. We all first met in 2009 during a function, celebrating his 80th birthday with the comrades of the ANC. Mr. Dibe and I made our last portrait together in 2014, and in 2016, the Bishop passed. Mrs. Dibe, holding the portrait of her late husband, Bishop Cecil Shuping Dibe. 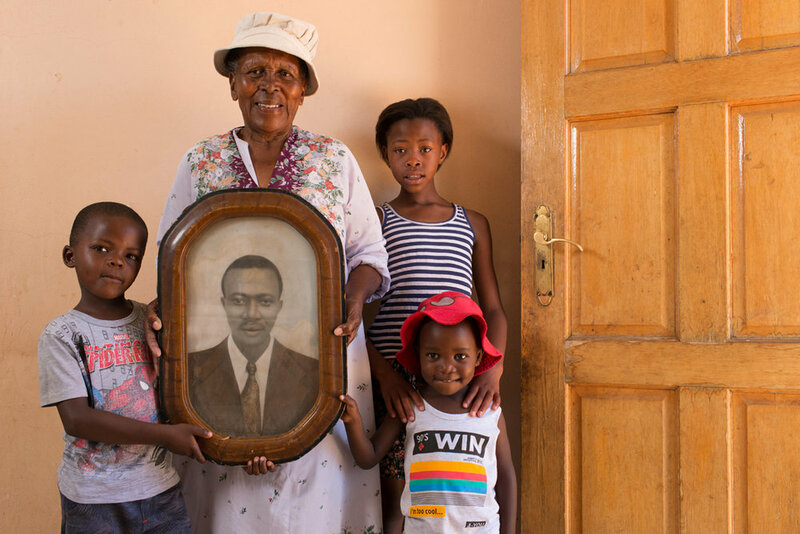 Adelina is surrounded by her grandchildren Thuto (6), Ntombizodwa (11) and Boichoko (3). Jabulile Dibe (28), holding the two portraits her grandfather and I made. No man is an island. Random short stories from the City of Roses and other Mzansi landmarks.